Another note, there are disc options on this product. Most, if not all, 1.8T, 2.0T, and 3.0L customers should just get a Stage 1 Disc (Stock RS4). Some 2.0T customers with built motors could run a stage 3 or stage 4. 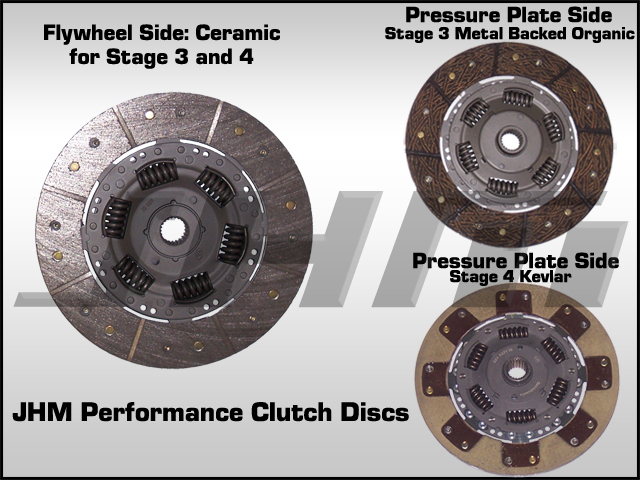 For 2.7T customers, see our LWFW and Clutch Combo page for disc recommendations. JHM has been testing and abusing our Stage 3 and 4 Clutch Discs since early 2009. This started with our B6-B7 S4 and B7 RS4 product development. In mid 2009, we purchased a 2005 B6-S4 to compliment our long time R&D car, our flagship 2001.5 Nogaro Blue B5-S4. To this day we still own, daily drive, and test products on our in house B5-S4. Of course this car has the full JHM treatment which now features a JHM built motor with Record Setting JHM RS6-R turbos. This car has been running our new Lightweight Flywheel and Clutch setup (with our Stage 4 clutch disc) with the B7-RS4 pressure plate for quite some time. We've seen much better results with this new kit and clutch discs. NEW VIDEO AS OF December 2012. 10.8 second quarter mile pass with our 2001.5 B5-S4, full weight street car with stock hood and full exhaust. This car has the stage 4 clutch disc and can hold some power. JHM burnouts and abuse from late 2010 with our B7 RS4 (we have since gone faster all motor). Yes, some of these are videos of our in house 2001.5 B5-S4, 2005 B6-S4, and our B7-RS4, not a B7-A4 2.0T. These videos better demonstrate the performance of these clutch discs due to the fact that these cars have way more instant torque than the B7-A4 2.0T. This is due to their increased displacement, all motor power design. They also don't suffer from turbo lag. Pressure plate manufacturers use torque - not horsepower - to measure how much power a clutch kit can hold. Torque - not horsepower - is a measurable value. Horsepower is created through torque and revolutions per minute of the motor using a mathematical calculation, not by measuring the force of the motor directly. Therefore torque - not horsepower - is critical when measuring the performance of a clutch disc. We looked at these results from our V8 cars and 2.7t cars and thought that we had to get these clutch discs on a B7-A4 2.0T. - CLUTCH DISCS - These are available in 2 stages. See drop down boxes below for all options and their prices. -JHM Stage 3 (hybrid Ceramic/Metal Backed Organic): Good for all Stage 2+ (FMIC, FULL Exhaust, Upgraded HPFP), Stage 3, Big Turbo 2.0T stock or built engines. 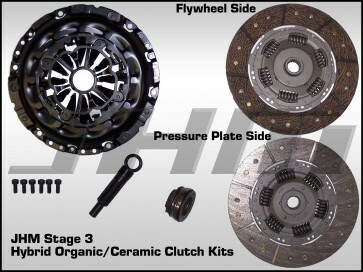 NOTE: Stage 4 (hybrid Ceramic/Kevlar) Clutch Discs have been DISCONTINUED. If you are looking for a higher performance clutch setup than our Stage 3, we recommend our JHM R-Series Clutches that are more performance oriented and still retain street-ability. - This Performance Clutch Disc and OEM Pressure Plate will fit the OEM B7-A4 2.0T Dual-Mass Flywheel along with any aftermarket flywheel that is designed to work with the OEM Pressure Plate. INCLUDES THE FOLLOWING - OEM B7-A4 2.0T RS4 pressure plate - clutch disc (choose stage below before ordering) - 6x Pressure plate to flywheel bolts - Throwout bearing - Clutch alignment tool - Pilot Bearing (presses into crank). NOTE: Clutch break-in is important and must be done properly. You need to do as much city type driving as you can for the first 500 miles the new clutch is in the car. Each time you start from a stop or shift it aids in the break in process. Highway mileage does not count. You also MUST avoid any racing activities, launching, or aggressive driving during the break-in period as this gets the clutch disc too hot. With that being said, you can go full throttle but you just can't speed shift or power shift.